There are many ways to increase energy. Food is too often the go-to substance for a pick-me-up, as food is a primary source of nutrients to provide energy to our cells. Meditation is a way to manage and focus our energy. Daily meditation helps calm our mind and our body to reduce stress and improve energy. And exercise, especially mind-body activities like Pilates, is a form of moving meditation. Not only does Pilates help deepening the connection between mind and body to reduce stress and improve focus, but by enhancing our strength, flexibility, and fitness we develop stamina. Ideally exercise should not wipe you out and leave you exhausted, but instead energize you so that after a long day at work, you have an abundance of energy to enjoy life, have fun, and play. Add to your reserve stockpile of energy, Do Pilates! Posted by Aliesa George in Mind-Body Health, Quotes, Rejuvination. What makes you happy? What hobbies do you enjoy? Who do you like “running around” with? Most likely your favorite activities require you to be physically active in one way or another. Whether it’s playing tennis, chasing grandkids, hiking, swimming, jogging, or jumping in puddles, you need to have physical fitness to be able to enjoy life and do the things that make your heart smile. It takes a bit of work every day to stay strong, fit, and flexible enough to be able to do all the fitness and daily-life activities you love. So next time you’re struggling through your Pilates Hundreds, slogging through mile 3 of your run, or feel like you can’t lift that weight one more time, remember you’re not working out for a workout, you’re doing it to have the strength and stamina to do the fun things in life that make your soul sing, bring you joy, and keep you happy! Whole-Body Health and Happiness Starts with Physical Fitness! Posted by Aliesa George in Quotes, Rejuvination, Uncategorized. Are You Getting Enough Sleep To Maintain Your Good Health? Have you seen this interesting Wall Street Journal article and video interview of author David K. Randall by Ryan Sager on sleep, and why we’re not getting the rest we need. How much sleep do you get every night? Is it enough to wake-up refreshed, re-energized, and ready to start your day? Continue Reading ‘Are You Getting Enough Sleep To Maintain Your Good Health? Posted by Aliesa George in Health, Rejuvination. Posted by Aliesa George in Motivation, Inspiration & Goal Setting, Rejuvination. What’s Your Main Focus – Features or Flaws? Do you LOVE Yourself? Do you LOVE your body? Are you doing healthy things on a regular basis to treat you with love, affection, and kindness? I am well aware that I’ve got my own challenges with body image, and have spent my entire life struggling to overcome them. (Some days I’m completely happy with me, and other days I feel like I’ll never have the body of my dreams… which causes me to feel bad that I’m not a lean, wispy, 5’6″ and 110 pounds. But instead a mere 5’4″, compact & muscular, and a fluctuating 150-155–Funny, 20 years ago when I was only 118-125, I had the same poor attitude and thought I was fat!) And unfortunately, I know that I’m not alone. With the hype and peer pressure from the media, and magazines–too many of us always point a negative, critical eye to our own body and we end up focusing on our flaws instead of our features! So let’s take a moment to celebrate how much we LOVE our features! I love sharing this exercise, and hope that you’ll drop me a line and tell me about your experience. Find a photo of yourself that you LOVE! Blow it up to an 8×10 glossy and print a copy. Get out a sharpie or your favorite magic marker. Around your body, write as many positive words as you can think of that express who you are and the things you love about yourself. 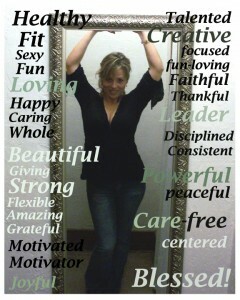 Frame your photo & put it somewhere where you will see and reflect on it daily! There is great power in positive words. The messages that we send and surround ourselves with (our mental self-chatter) really does affect our attitude and our health. Negative chatter = negative attitude, and positive chatter = positive attitude! Tell yourself daily how much you love YOU, and use this exercise to keep all the great things you love about yourself front and center so you’ll confidently be sending yourself daily doses of positive energy to stay focused on your great features instead of your flaws! Self-love is a key to wellness success! Posted by Aliesa George in Health, Mind-Body Health, Motivation, Inspiration & Goal Setting, Rejuvination. What Can Winter Olympic Athletes Can Teach Us About Overcoming Fear? Fear or Folly! Scared or Jolly! What’s sad about this is that for many of us, FEAR stands in the way and blocks us from even attempting new things, or taking the necessary steps to break old destructive patterns. I say this in the first person, because I too am human, and actually conscious of at least a few of my self-limiting fears. Let the big ugly FEAR monster get the best of us. Chances are once we’ve made it to the other side of a fearful experience – we can check that off our list and be proud to know that in that moment – fear did NOT get the better of us. Whether you’re flying through the air on skis, or flying through some other mental or physical fear, without actually moving through fear you won’t know where you’re going to land, or when you’re going to land, or how perfect that landing might be… But if just like an Olympic athlete, you’ve done the right things to prepare, and have the knowledge and skill required to reach the goal – regardless of where you land, going up means you’re going to come down so why not land on the other side of your fears. You can’t really decide if it’s fear or folly and your scared or jolly until you’ve taken that deep breath and moved forward through your fear – whatever it might be! Is this now one of my most fun and favorite things to do? How do I feel about myself and my accomplishment? 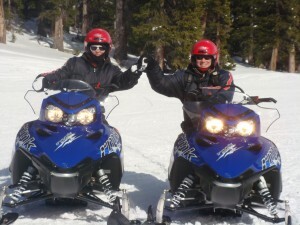 A few weeks ago I went snowmobiling for the first time. Mind you I have a fear of motorcycles, speed, and lack of doors and seatbelts! The first hour was ok, on very flat trails at my 12-15 mph pace, but the two daredevils that I went with were itching for more, so we headed up the mountain and I saw my speed increase to 17-25mph in an attempt to keep up… I’m sure that some of you are laughing at this snail’s pace, but for me it felt like 100 mph and on the edge of out-of-control! And of course once we got farther up the mountain, I was faced with the fact that now I had to go head-first, straight down! I sat on the edge of the precipice, looked at my fiancé – and said…You guys have fun – I can’t do this!!! I was terrified. We had another 3 hours left on our snowmobile rental and I knew that I was letting my FEAR spoil the day. So I took a very deep breath and plunged head first down the hill! AAAAHAHAHAHAHAAAAAUGH – I was screaming the whole way! And you know what…it was scary – but not as bad as I thought it was going to be. I did a lot of hills during the next 3 hours and while I cannot sincerely say that I loved my snowmobiling experience and look forward to doing it again – I am proud that in the moment, on that day on the mountain, I overcame a big moment of FEAR. What have you done lately that scared you and how did things turn out? Any words of advice to share about overcoming fear?